Things are nutty as a fruitcake over at Lyric Stage at the moment. The popular theatrical company is ending its season with silly fun via The Marx Brothers musical "Animal Crackers," directed by Lyric's Producing Artistic Director, Spiro Veloudos. Back in the day, The Marx Brothers -- Groucho, Chico, Zeppo and Harpo -- capitalized on their popularity by taking to the stage. "Animal Crackers" was the third in a series of live stage shows that included "Cocoanuts" (which tried out on Boston) and "I'll Say She Is." "Animal Crackers" played Broadway in 1928 and was captured in a film version two years later. With music and lyrics by Bert Kalmar and Harry Ruby and a book by George S. Kaufman and Morrie Ryskind, "Animal Crackers" (like the others) was specifically stylized to showcase the brothers' unique brand of mayhem. The plot, in a nutshell, involves a bosomy society dame (Leigh Barrett, at left) tossing a lavish party at her lavish Long Island manse both to honor the famous African adventurer Capt. Jeffrey T. Spaulding (Ed Hoopman, with Barrett), and to show off an expensive masterpiece she's acquired. The artwork is, of course, stolen during the festivities. And Captain Spaulding turns out to be a frenetic whack job who spouts nonsequitor conversation brimming with insults and put downs. A perfect setting, of course, for The Marx Brothers. Filled with puns and loads of visual gags, the night is like a series of sketches, all tied together by the party. Harpo (oddly cast with a woman, as was the case in the Chicago production) chases the dames and toots his horn. Chico plays the piano and speaks in broken English. And Groucho comes up with broad, seemingly nonsensical comments, all of which require that you listen very closely lest you miss the volley of bon mots that machine gun through the air. Among the well-known chestnuts, "One morning I shot an elephant in my pajamas. How he got in my pajamas, I don't know." More than once, Groucho breaks the fourth wall to lean into the groaning audience to advise, "These are the jokes folks." 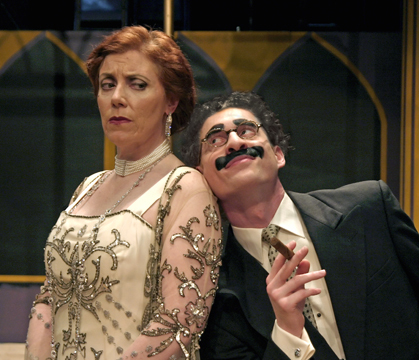 In keeping with Groucho's irreverent style, there are a couple of local references added as well as a funny aside to Lyric's winter production of "Nicholas Nickelby." The best known song from the original show is probably "Hooray For Captain Spaulding," which became Groucho's theme song for life (. . . anybody old enough to remember "You Bet Your Life?"). One of the sharpest moments of the night has the brothers decked out in Madame DuBarry-esque constuming for "Four of the Three Musketeers." When the brothers are off stage, the paper thin sub-plots continue with romantic ballads, a cracking-wise reporter who speaks in tawdry tabloid headlines, and characters hoping not to be found out. Most of this pales in comparison to the Groucho sequences, but the cast gives it their all. Leigh Barrett takes on the Margaret Dumont dowager role of Mrs. Rittenhouse. Calvin Braxton is both a long-suffering butler as well as a preening millionaire. Aimee Doherty is Mrs. Rittenhouse's daughter Arabella and gets to deliver "Three Little Words" which was not in the original but has been added in more recent productions. Jordan Ahnquist, who scored brilliantly last season is SpeakEasy's "title of show" is great here as Wally Winston the gossip columnist. Alycia Sacco is Harpo, capturing the silent comic's timeless gags and facial expressions. Nael Nacer is Chico, providing a calmer balance to the two more exuberant brothers. Grant MacDermott fills the Zeppo role. And again, Hooperman is priceless as the sound-a-like, look-a-like, dance-a-like ringer for the iconic Groucho, right down to the broadly shoe-polished mustache across his upper lip. From Dickens to The Marx Brothers, it's been a "something for everyone" season at the Lyric. And on that note -- I must be going. "Animal Crackers" is at Lyric Stage Company of Boston through June 4. For information, call 617-585-5678.